To replace 2 old steam generators at the Arkansas Nuclear One power plant, 2 new generators, each weighing approx. 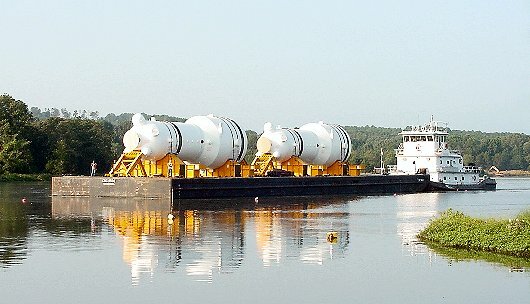 550 t, were delivered on the cargo barge PAUL BUNYAN in June of 2000. At a special prepared unloading slip off Lake Dardanelle, the barge was carefully ballasted down and grounded. Hydraulic multi-wheel trailers were rolled onboard and each generator was rolled off and moved to a temporary storage area for installation later. Detailed procedures were provided to pre-ballast the barge, ground the barge and maintain adequate and safe bottom reaction throughout the two roll-off operations. Ballast procedure to re-float the barge after completion of the roll-off operations.